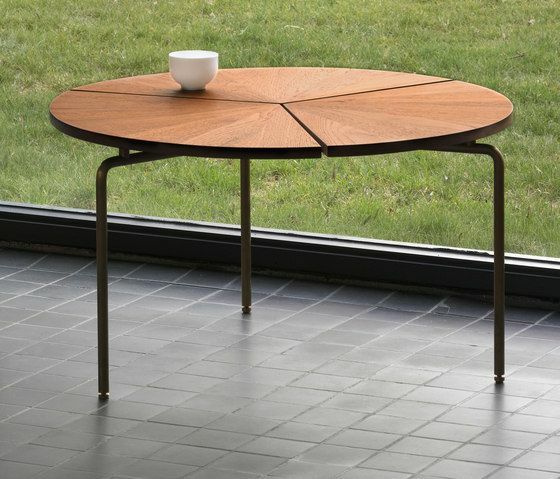 Planned for durability and elegance, the circular table series was originally designed to address the need for a sophisticated indoor/outdoor table. Constructed according to BassamFellows’ core value of “beauty without elaboration or novelty,” the simple, uncomplicated base is made of hand-finished solid brass. This three-legged base supports the tabletop and creates the illusion of a floating surface. The top is constructed of solid wood sections cut into wedges and arranged to form the geometry of a circular plate. The circular table series is suitable for both residential or contract use. Can be used outdoors in teak. Covered terrace recommended.